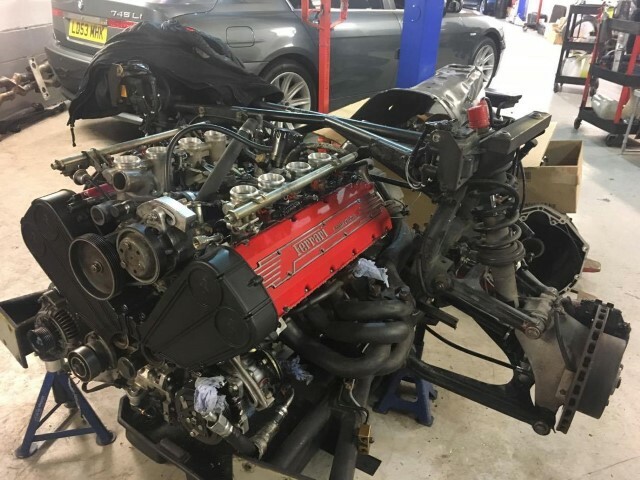 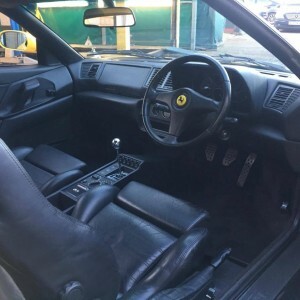 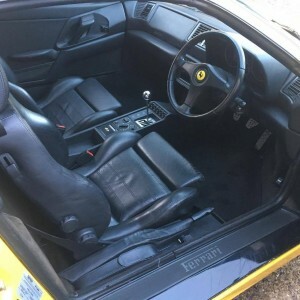 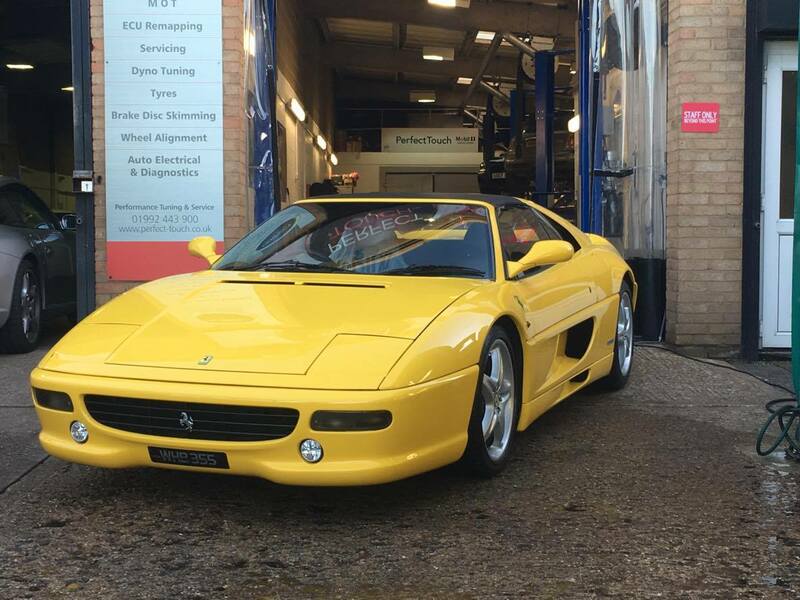 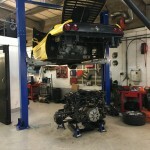 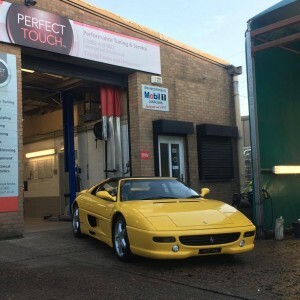 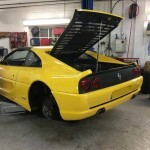 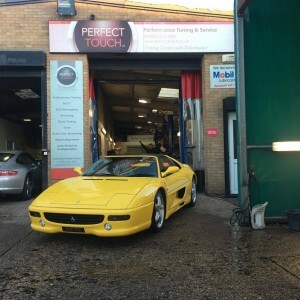 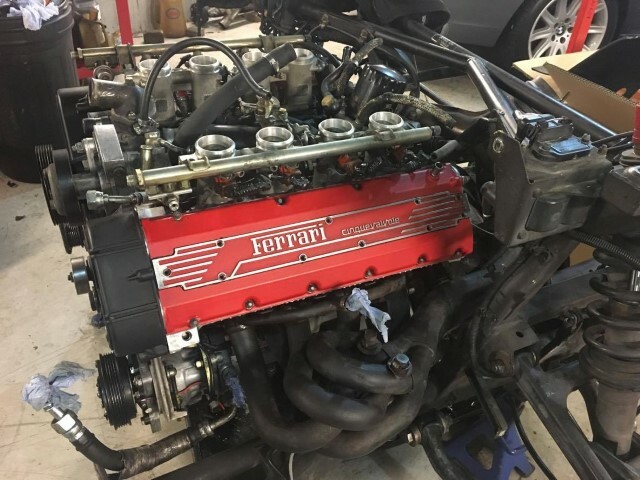 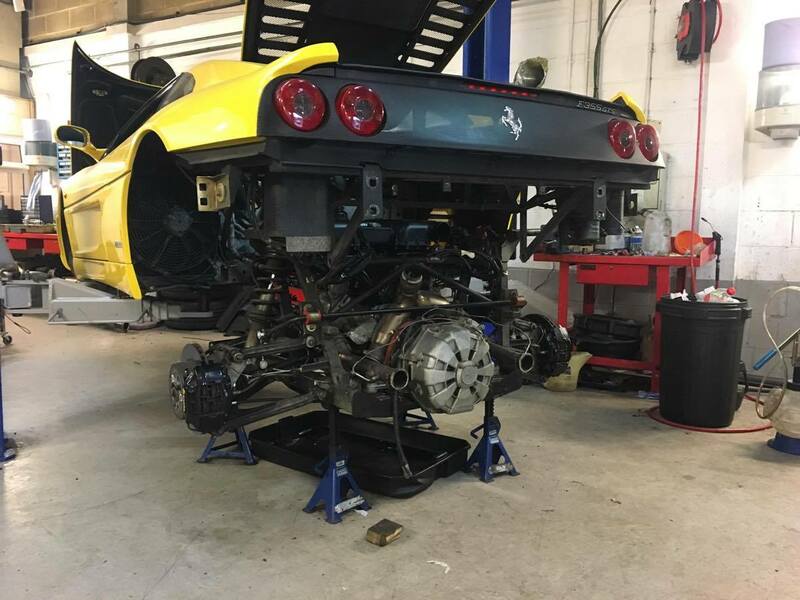 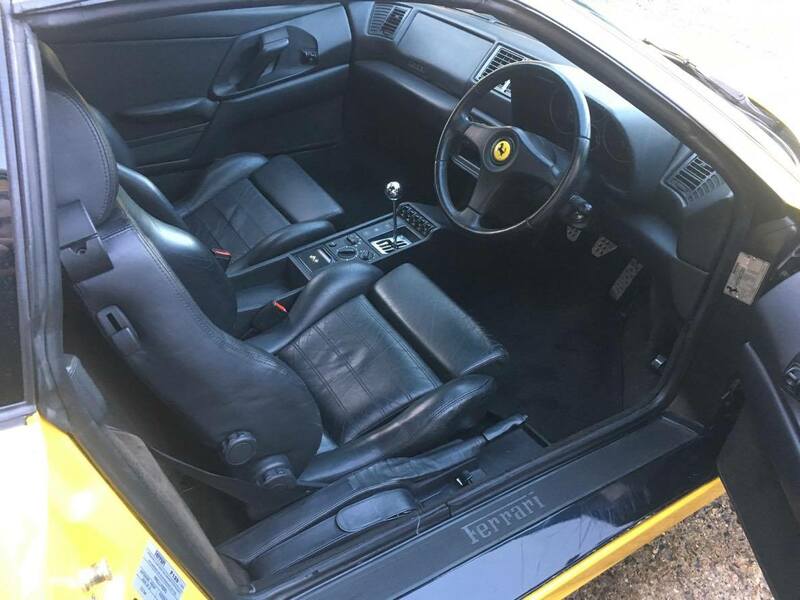 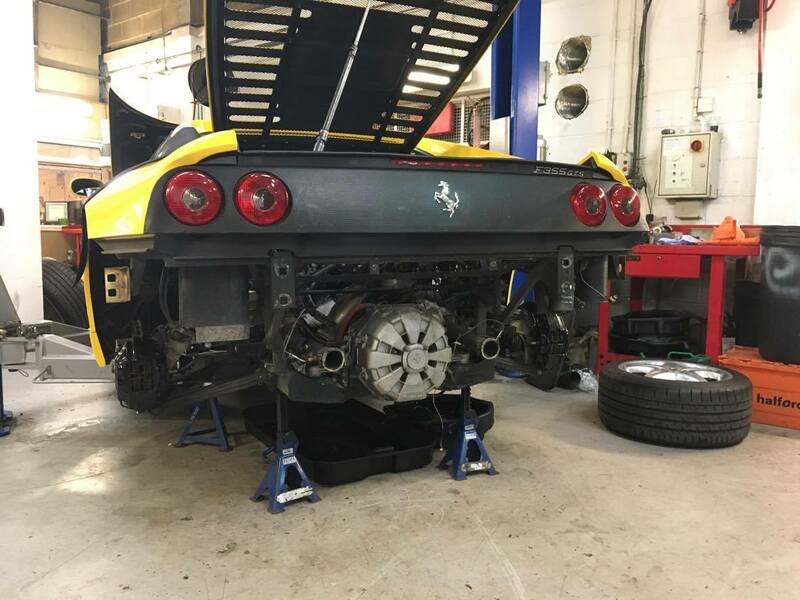 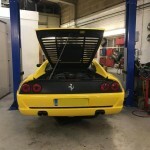 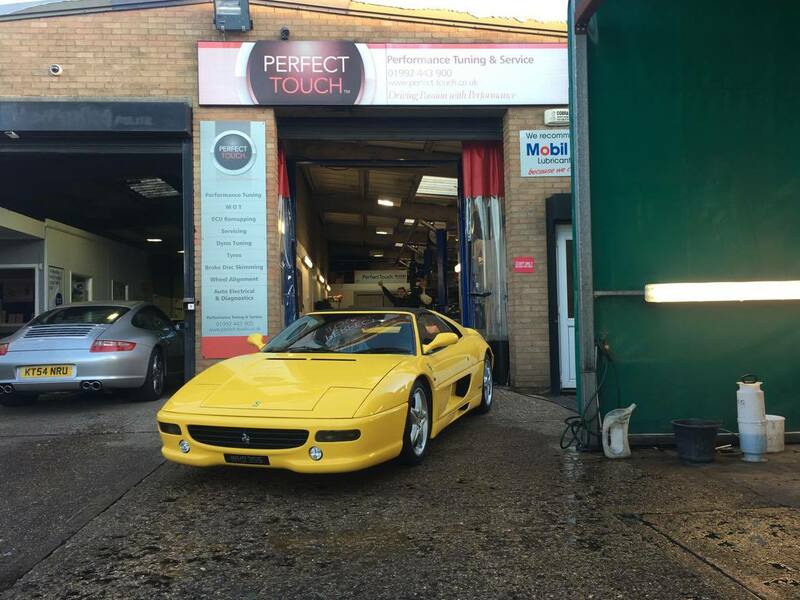 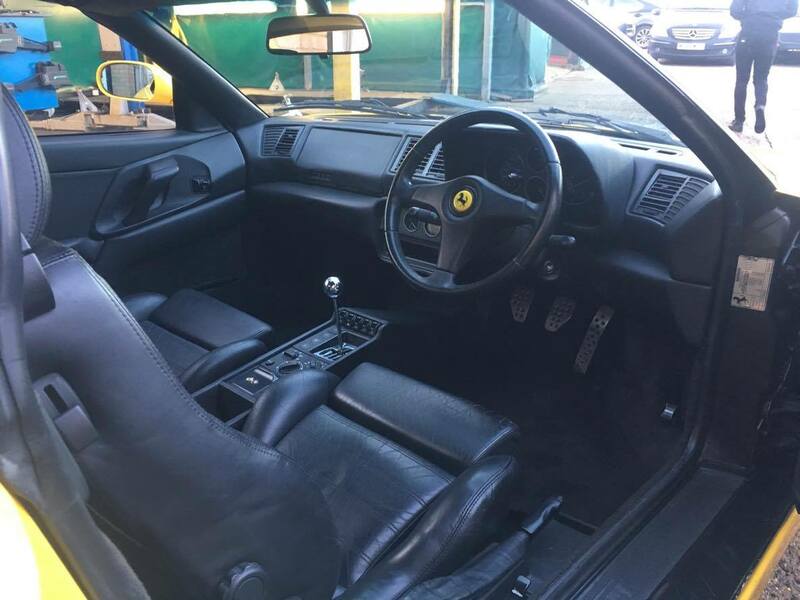 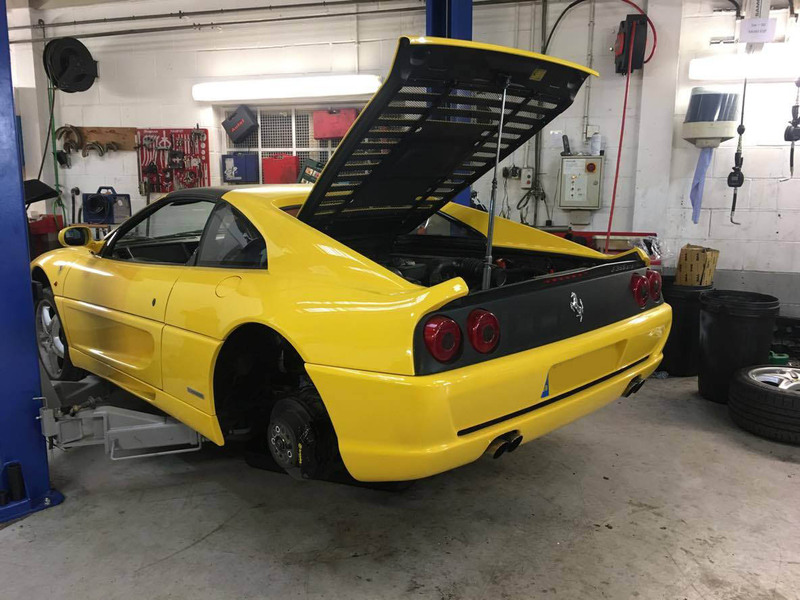 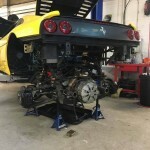 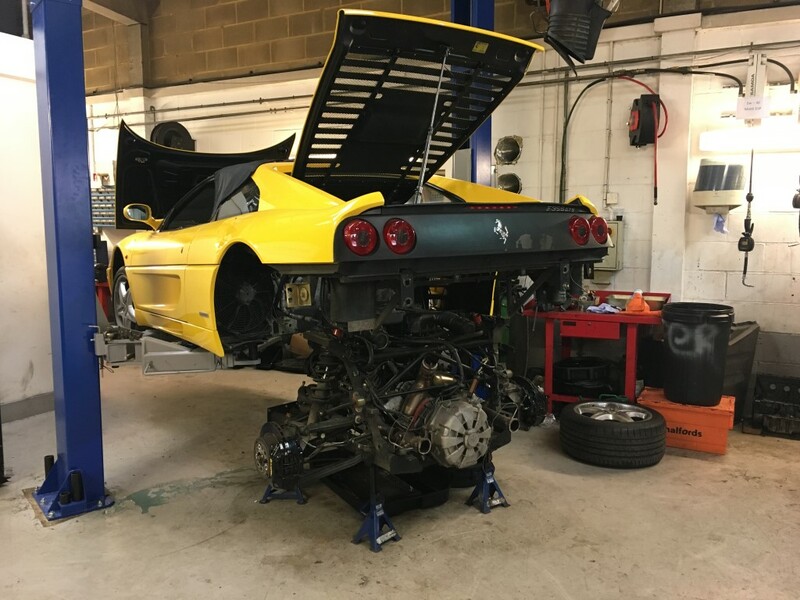 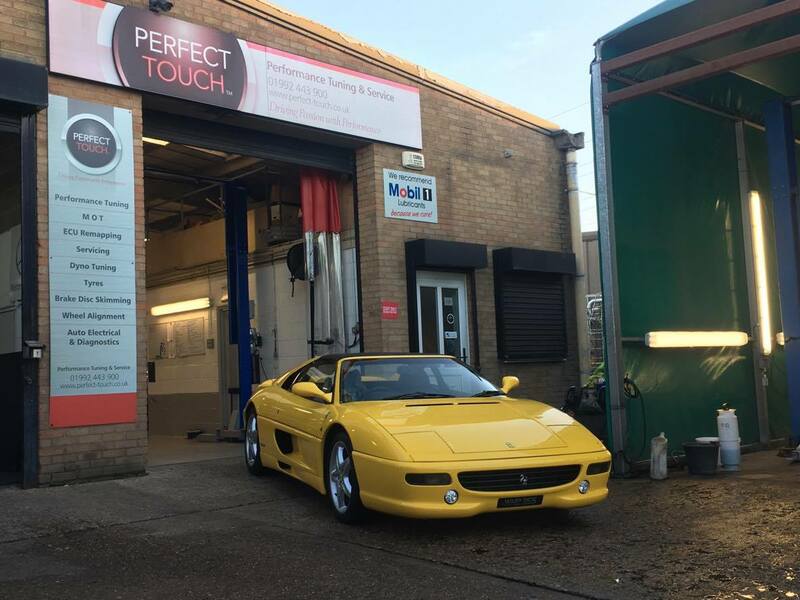 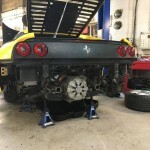 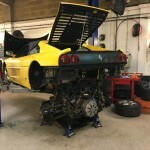 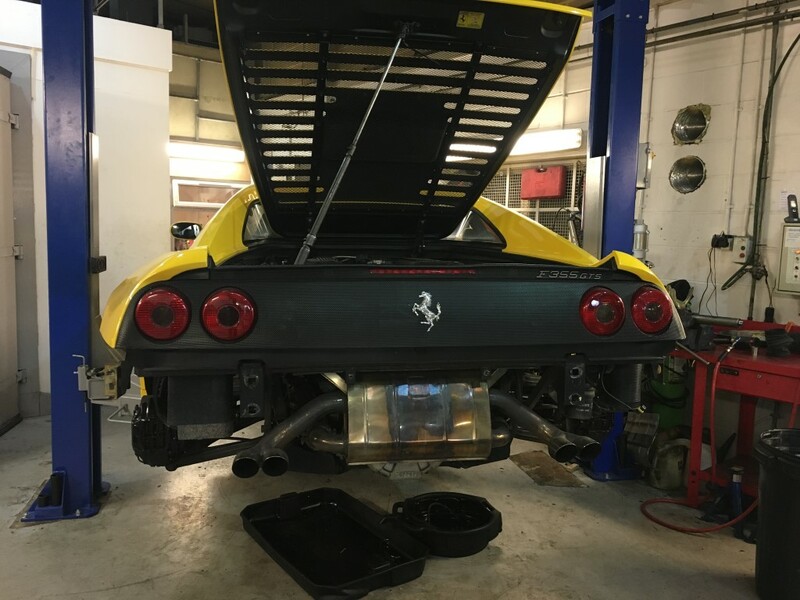 We are currently working on this beautiful Ferrari F355, this is the car that preceded the incredibly popular Ferrari 360. 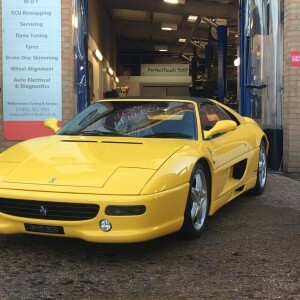 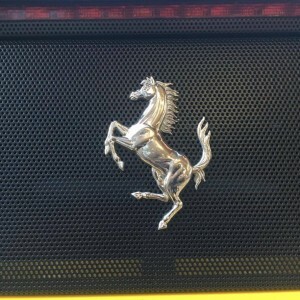 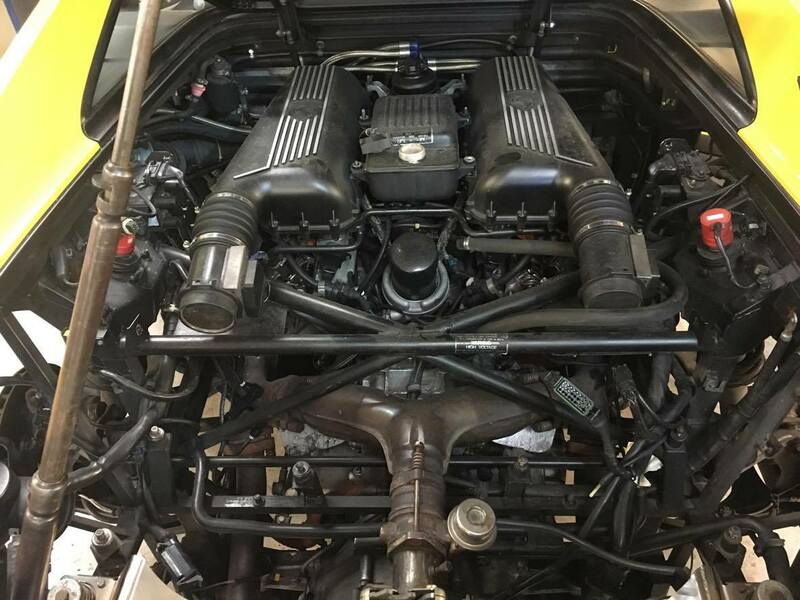 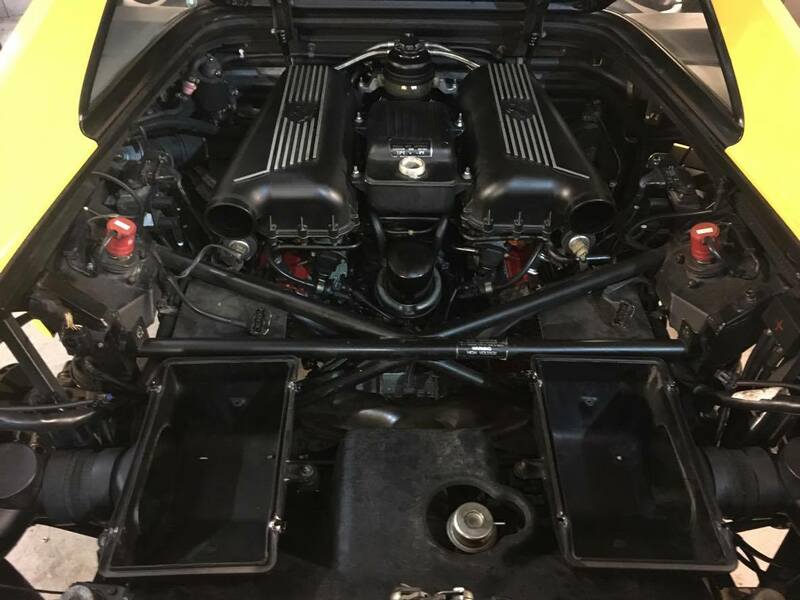 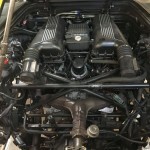 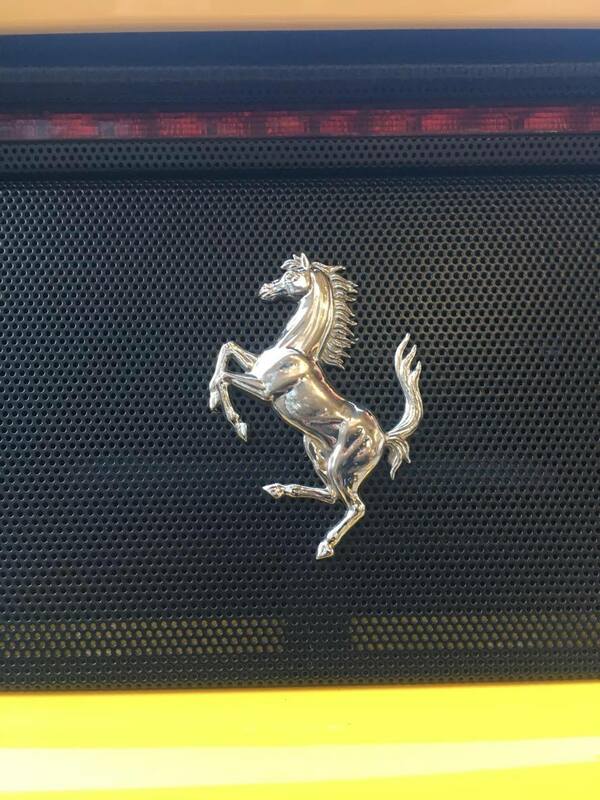 The F355 has a 3.5l v8 engine with 5 valves per cylinder, hence it’s name 355. 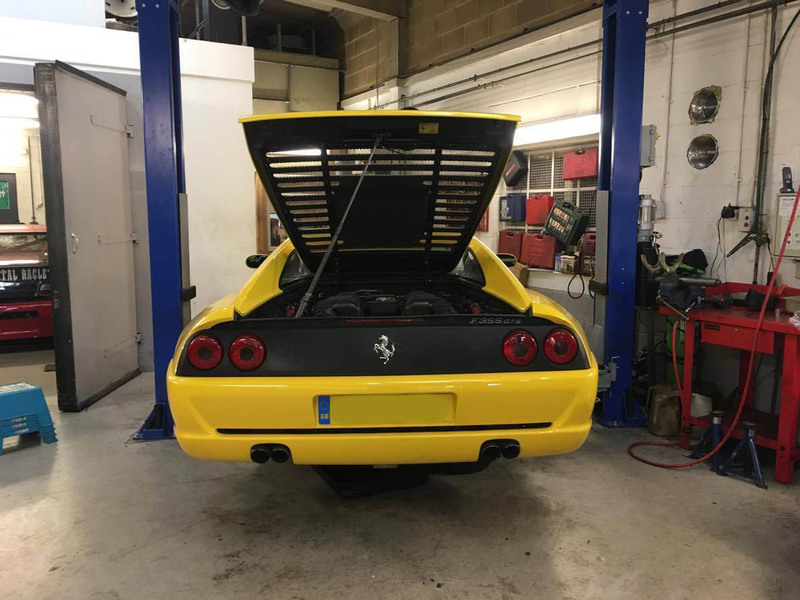 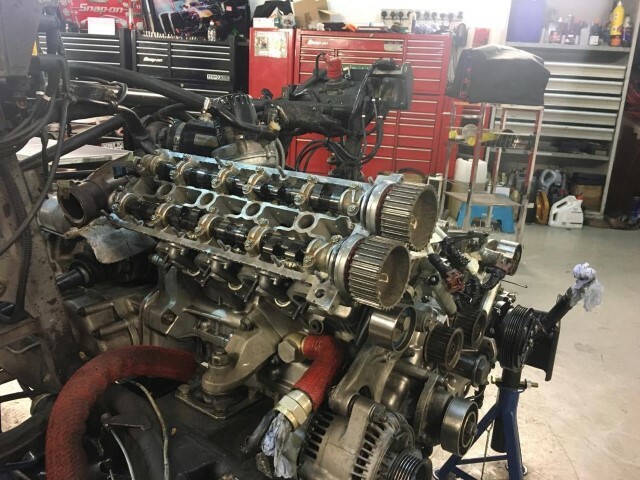 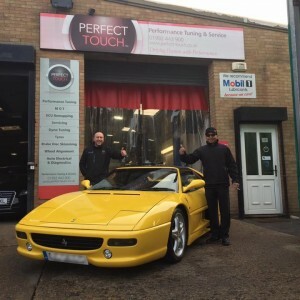 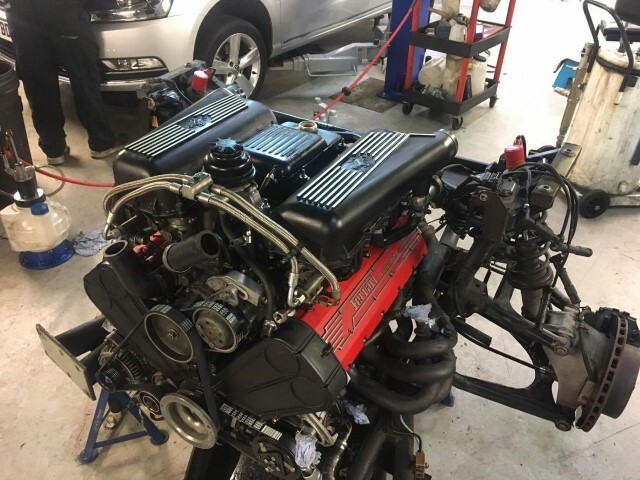 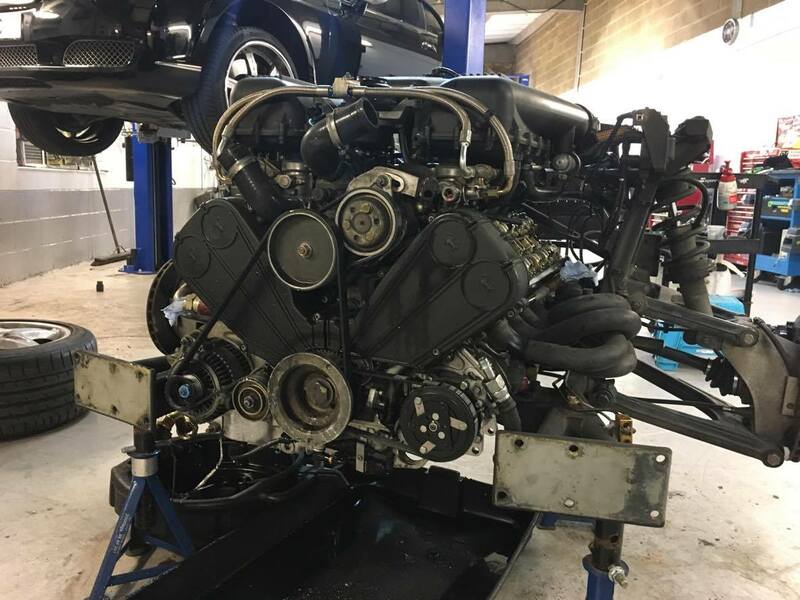 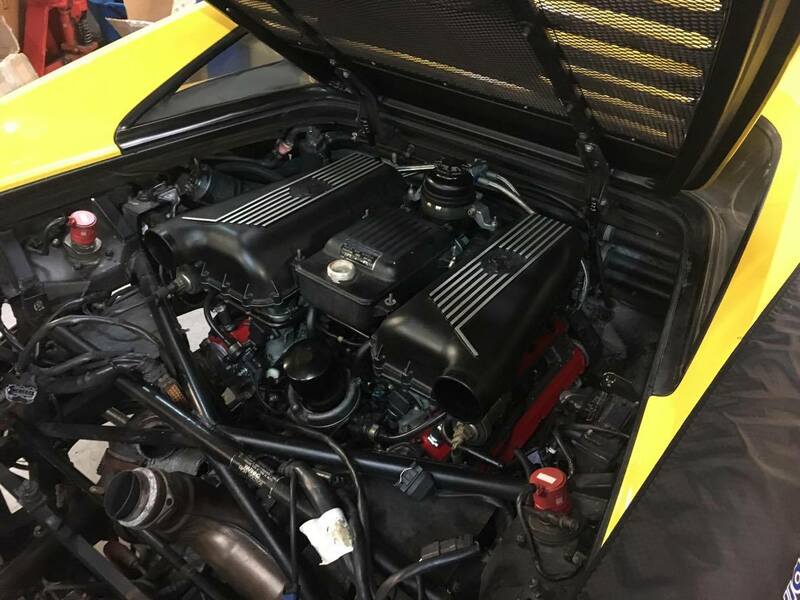 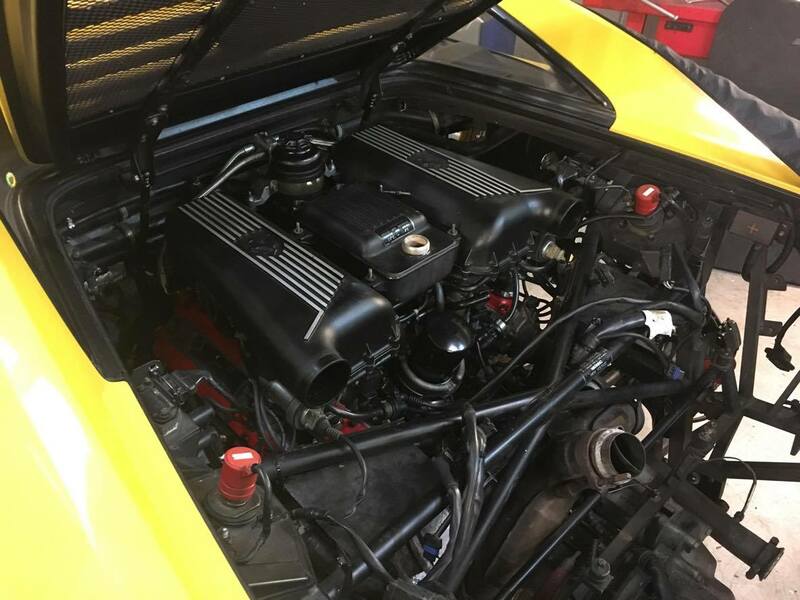 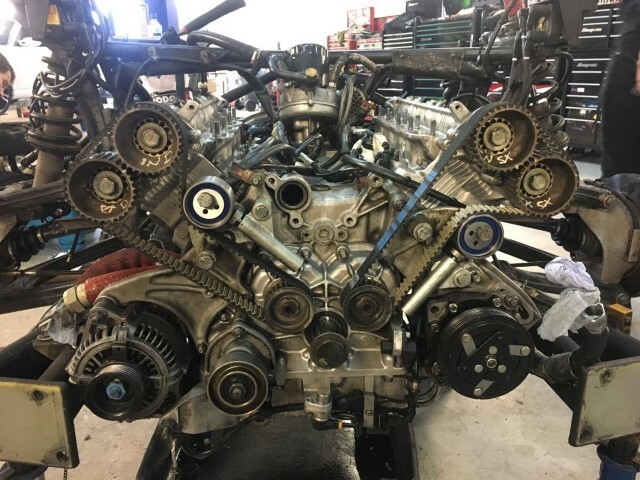 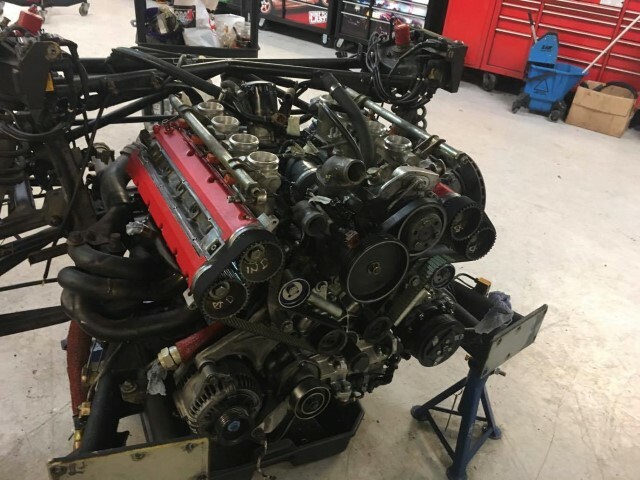 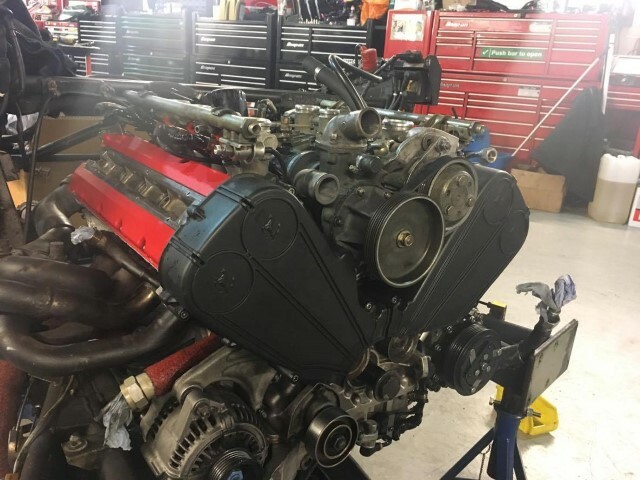 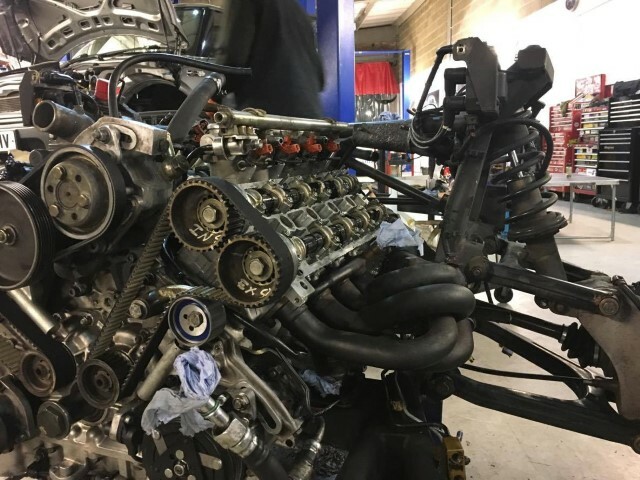 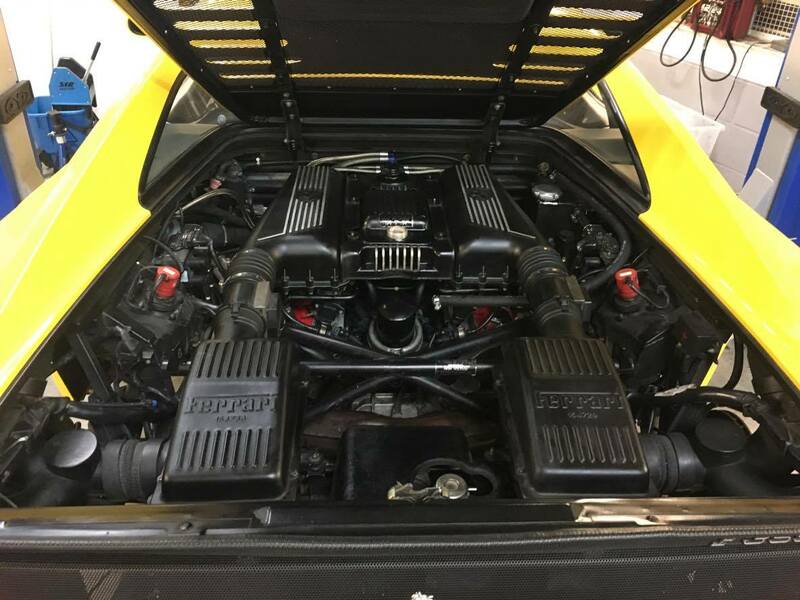 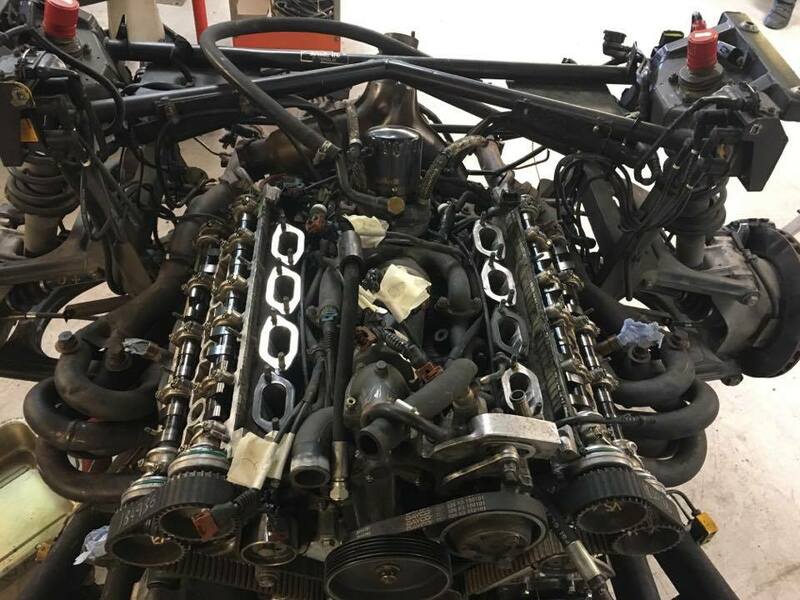 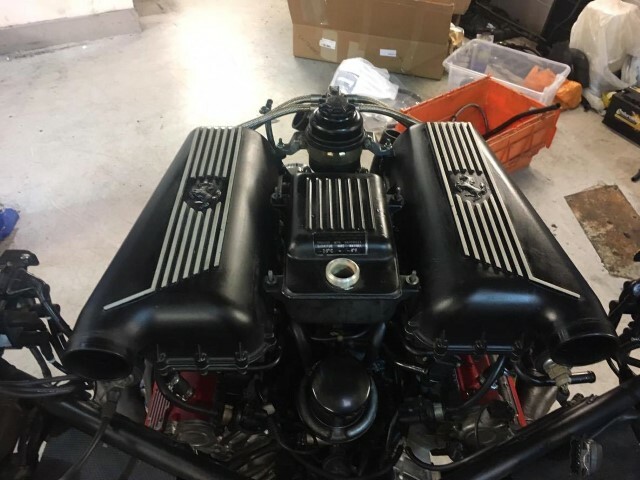 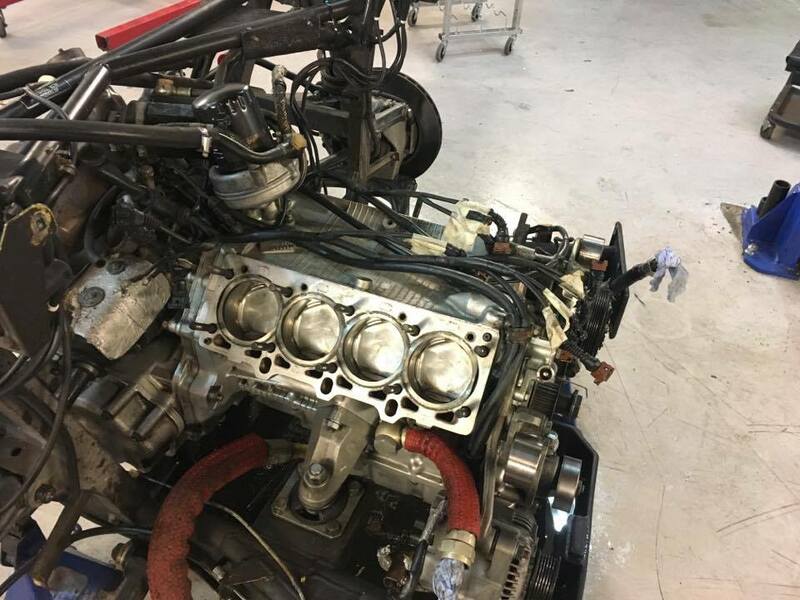 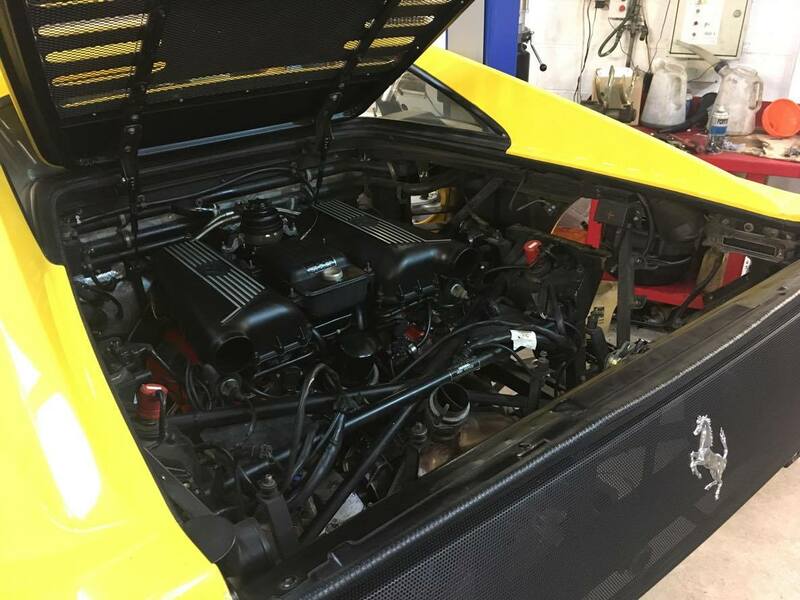 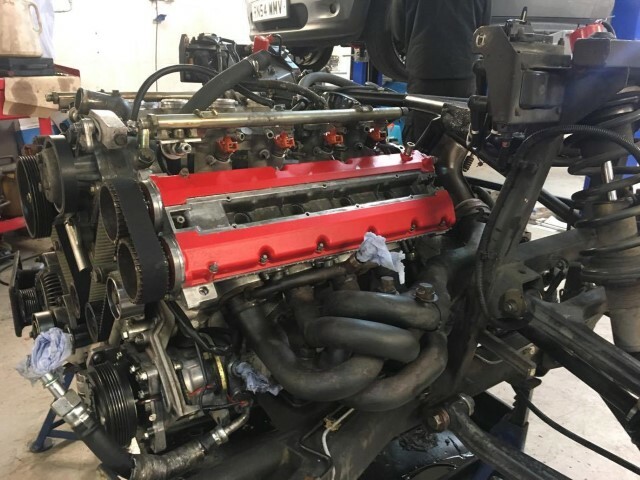 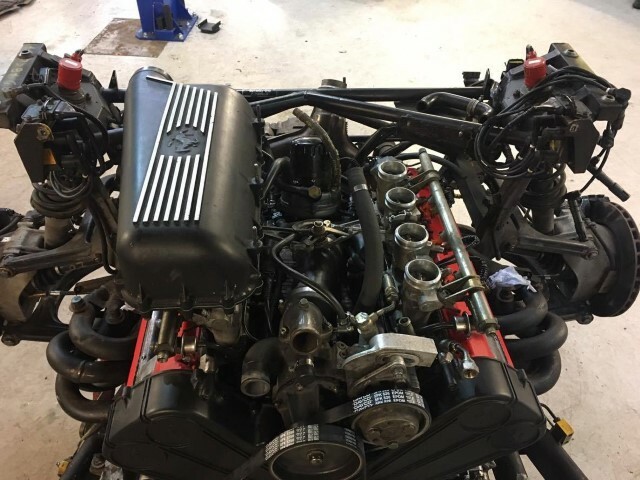 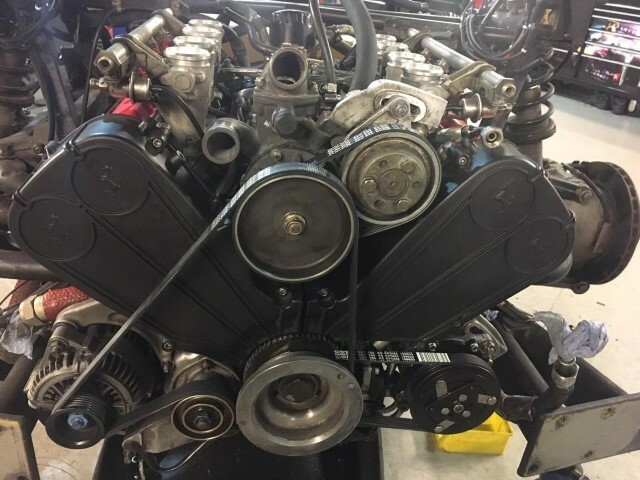 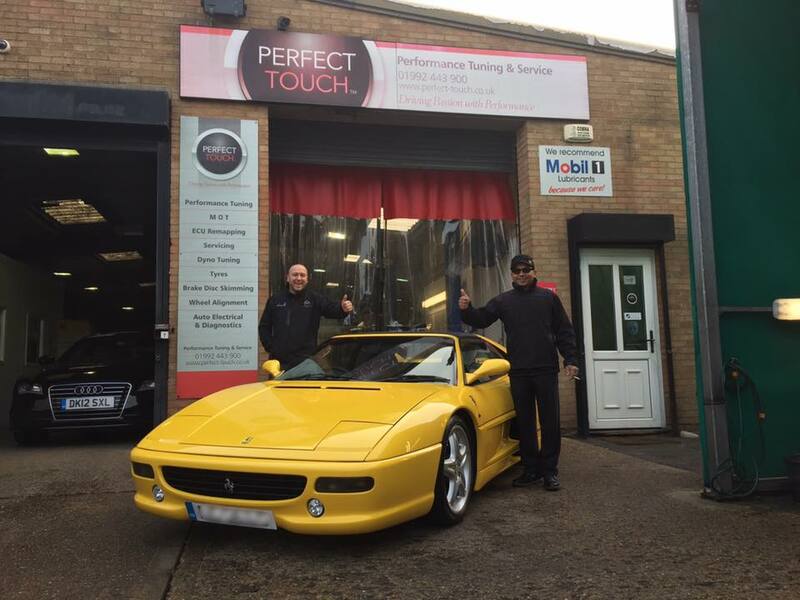 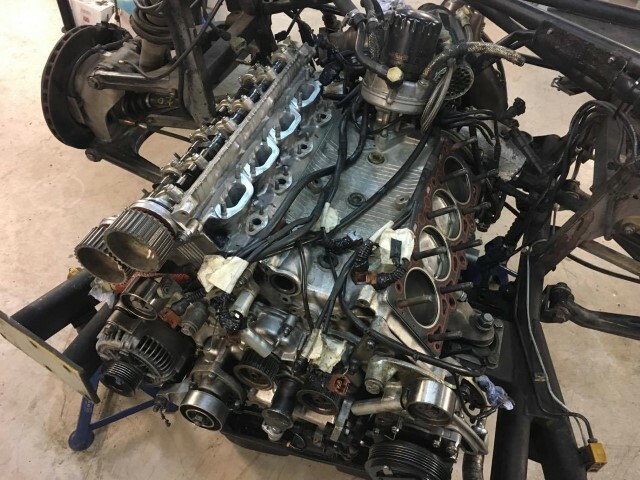 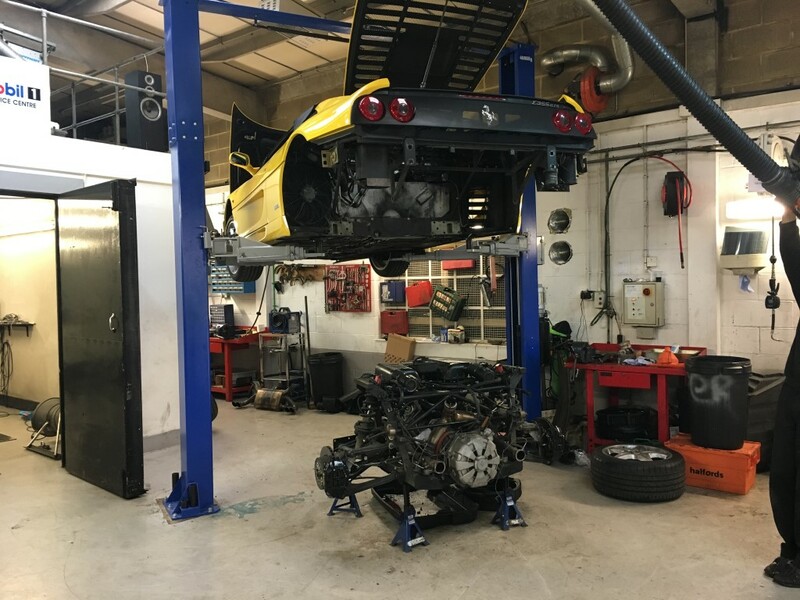 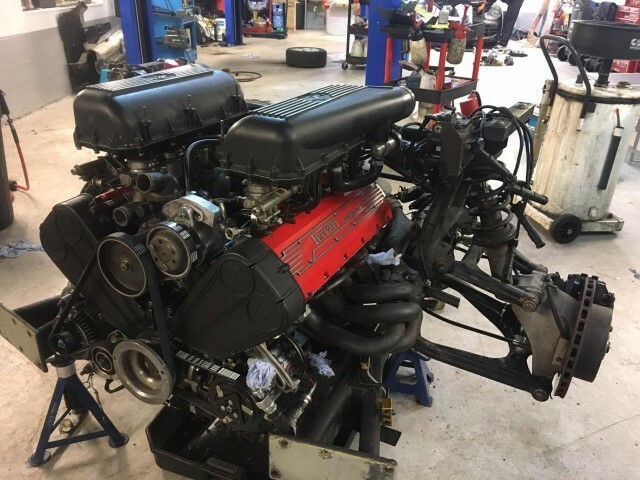 Our client brought this F355 in to us for a full check over as it wasn’t running correctly and there was a noticeable coolant leak. 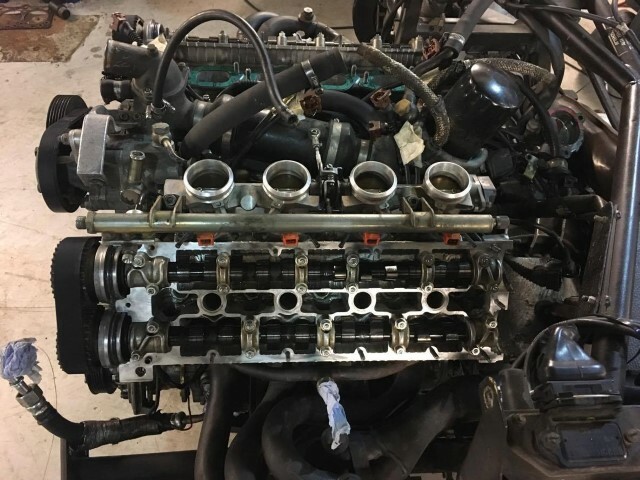 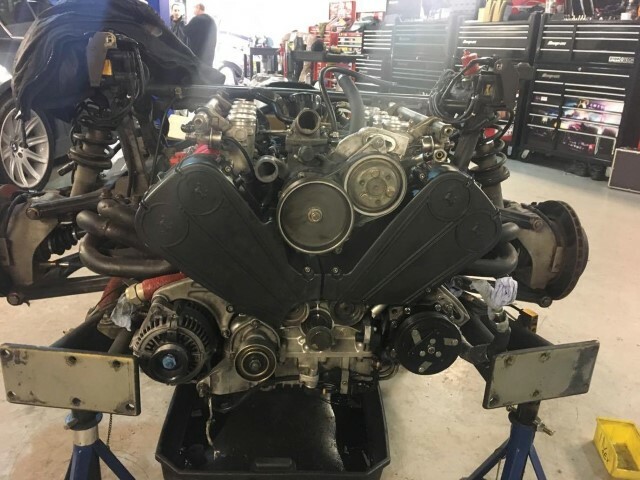 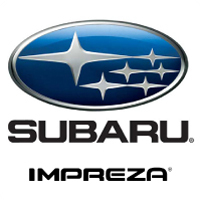 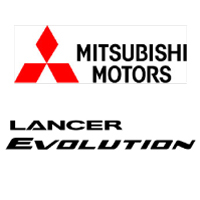 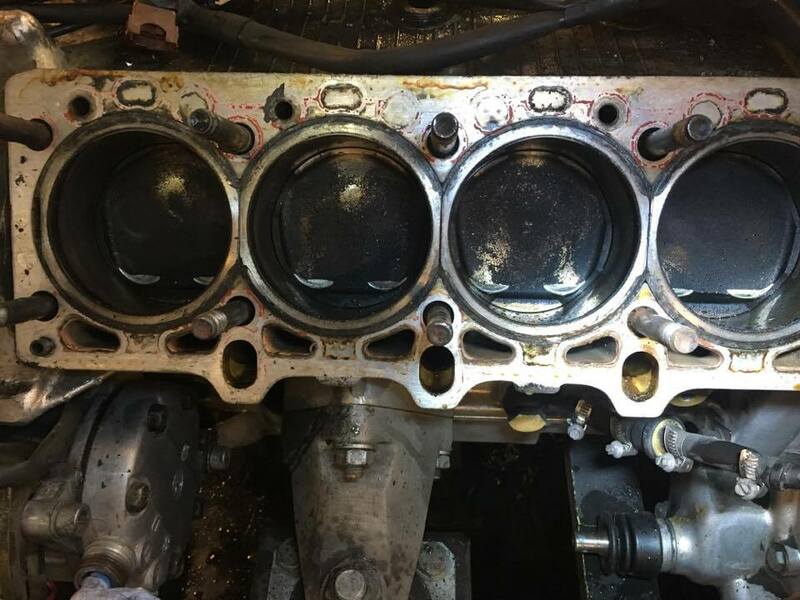 We gave the car a full check over and found not only a coolant leak but a number of oil leaks, radiator leak, power steering leak and some minor faults including bushes that needed replacing. 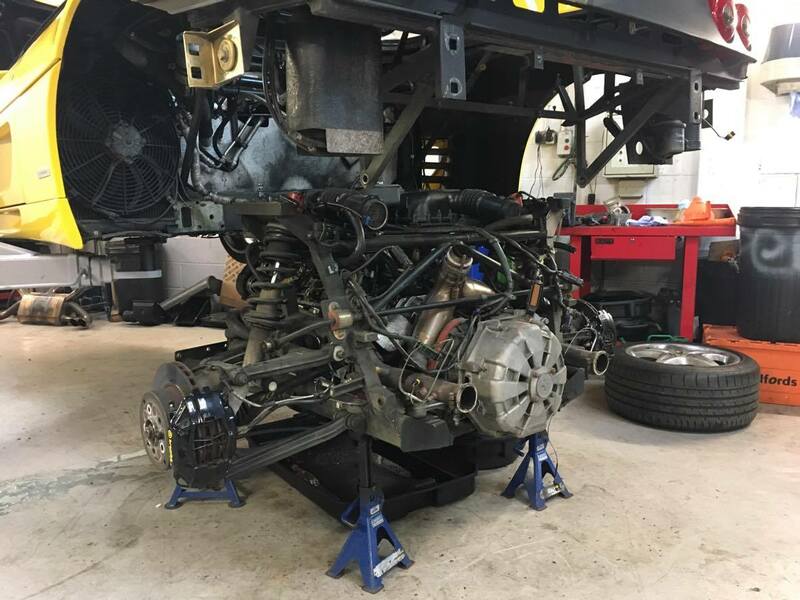 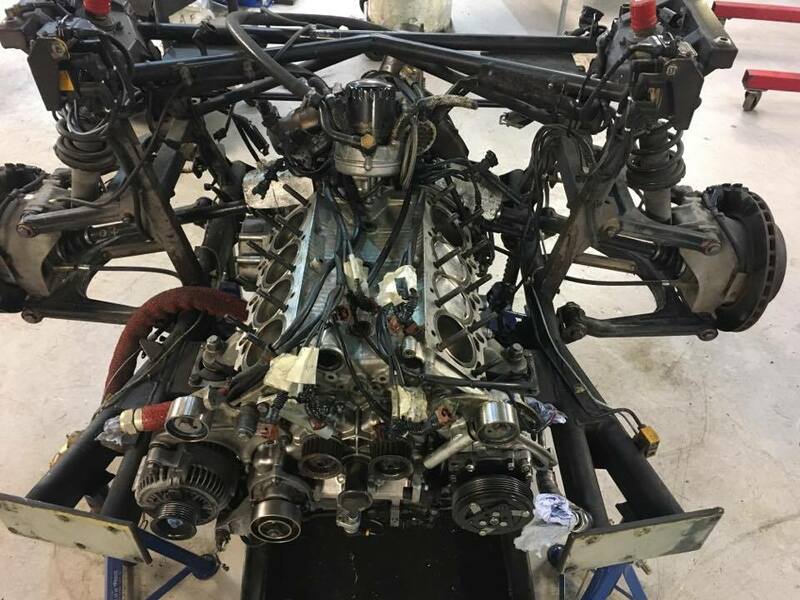 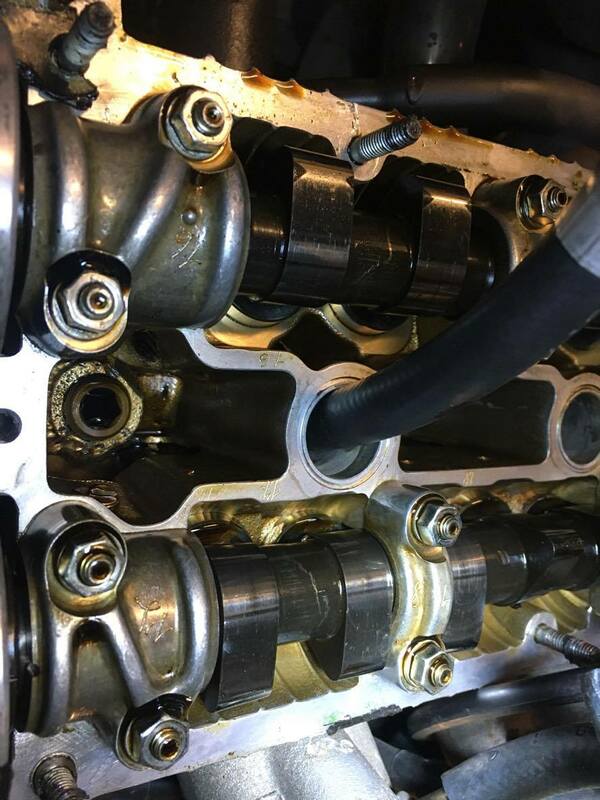 We began to repair the oil leaks, we had to remove the cam covers and while we were there we decided to check the cam timing – this unfortunately ended up being out. 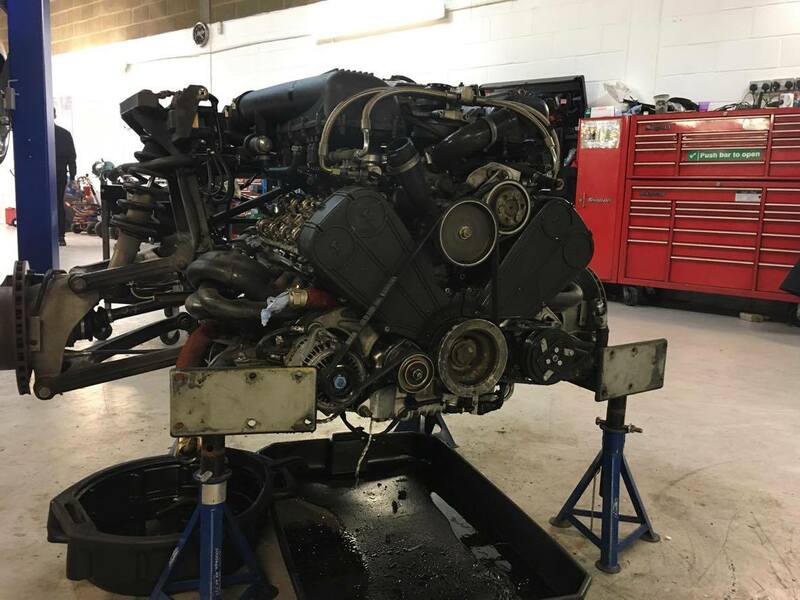 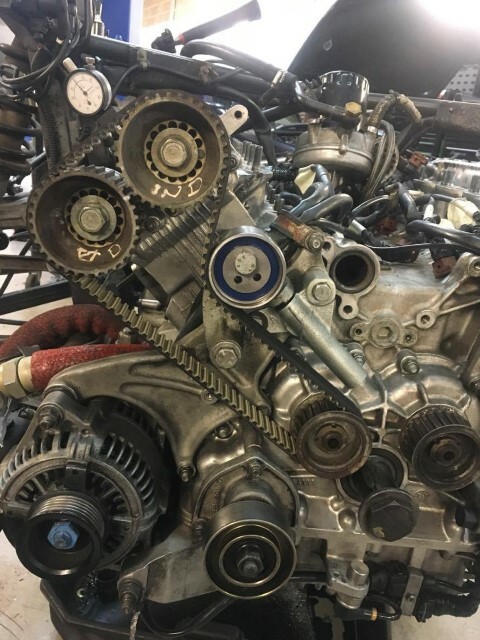 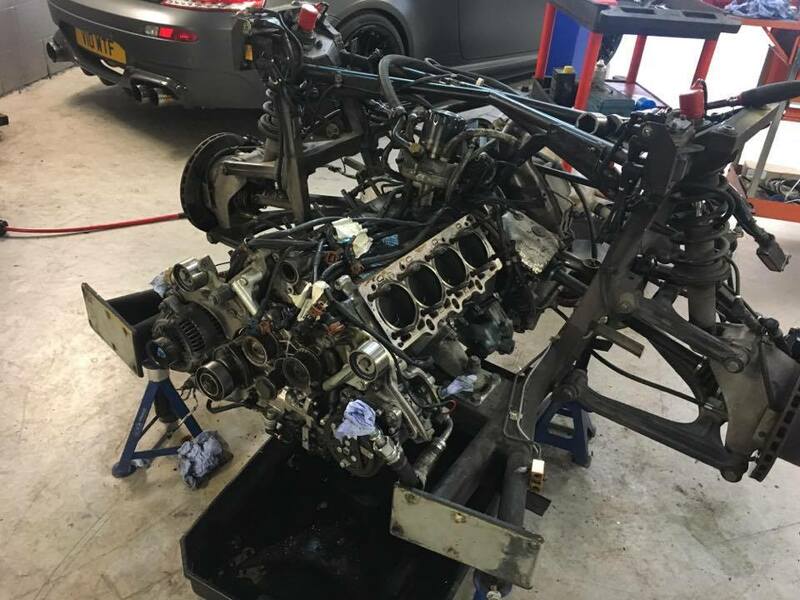 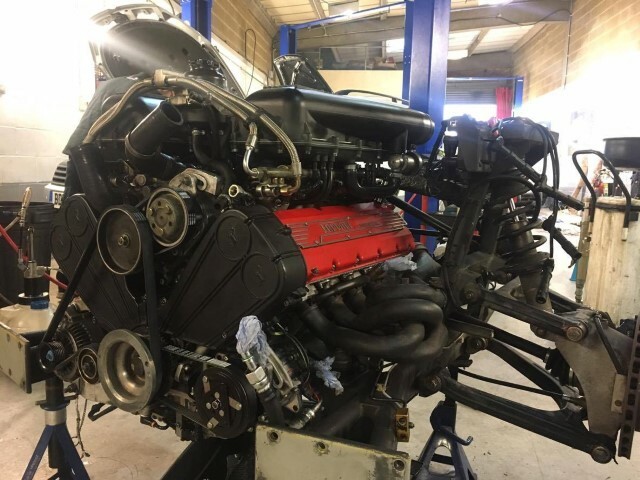 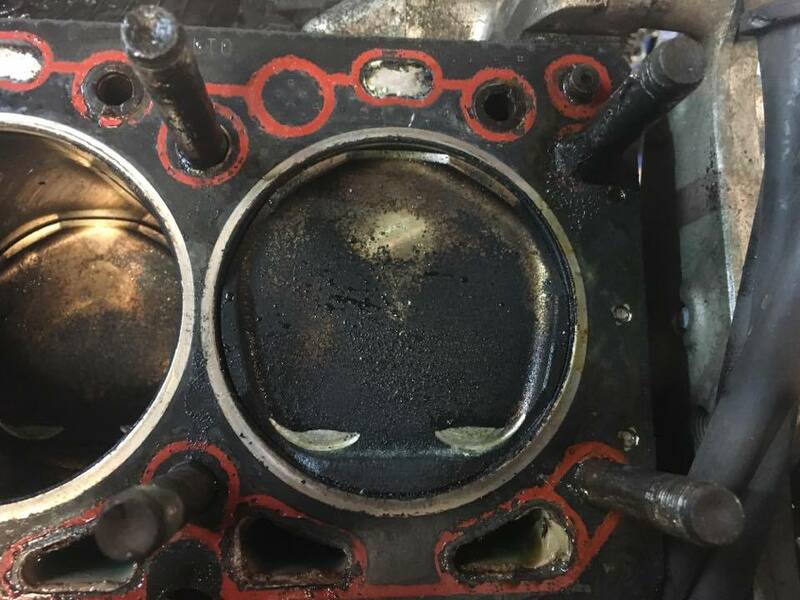 We then informed our client of this, as we weren’t happy with the way the engine was running, the cam timing being out could be the news we didn’t want. 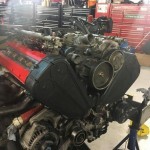 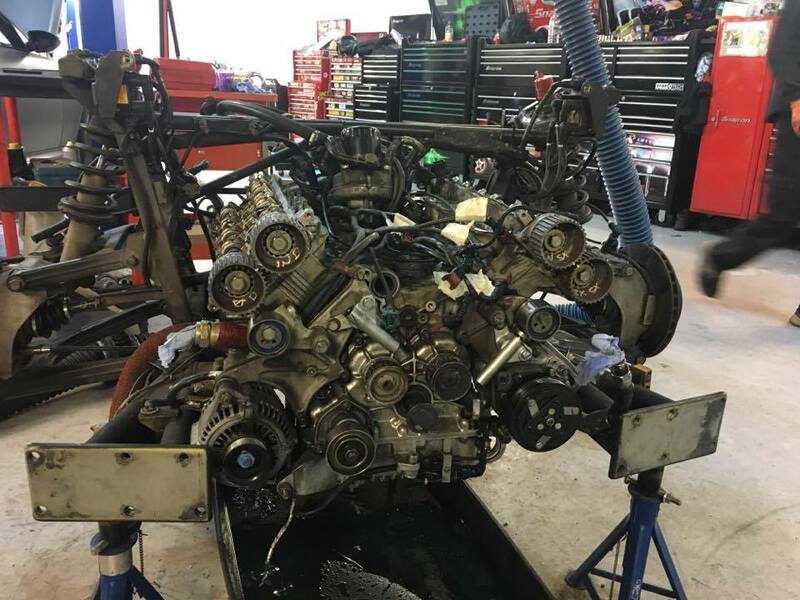 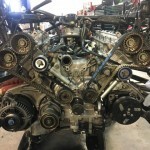 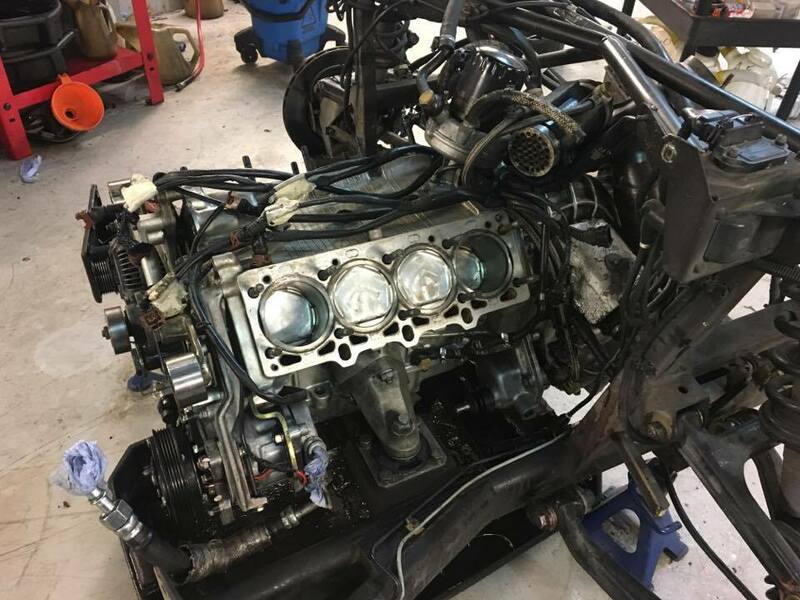 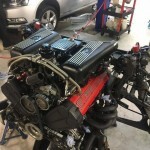 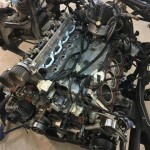 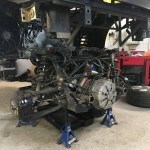 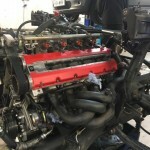 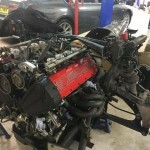 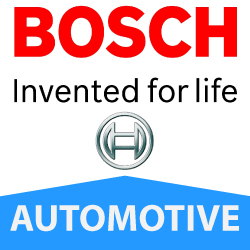 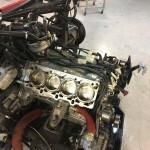 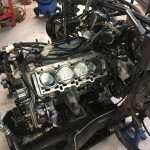 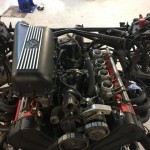 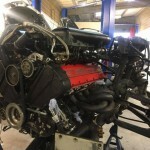 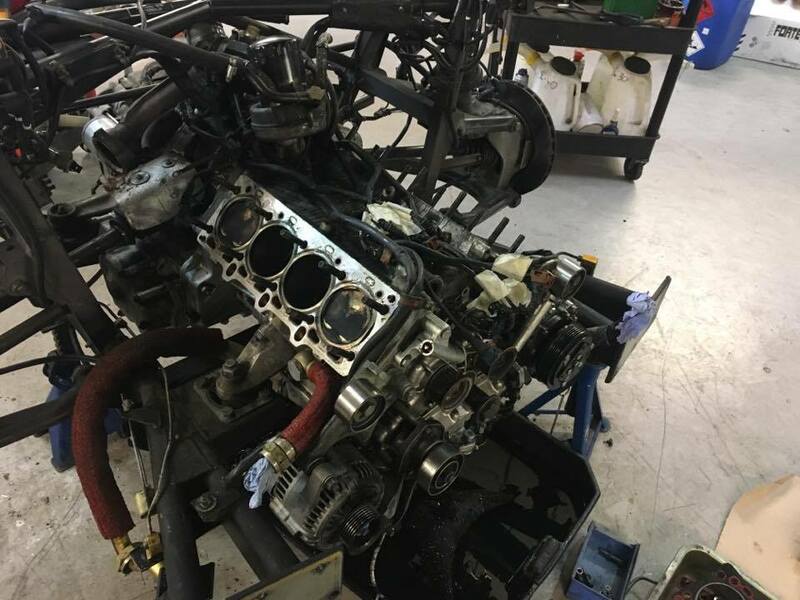 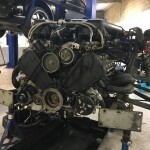 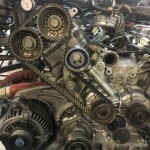 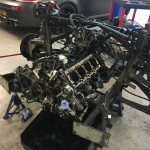 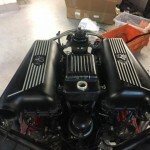 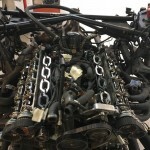 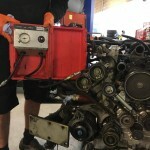 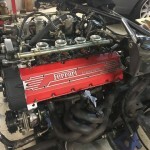 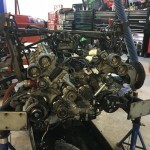 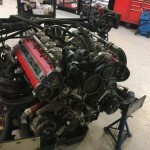 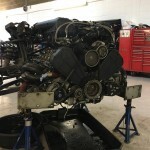 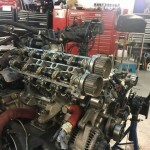 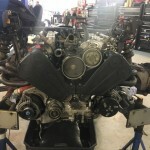 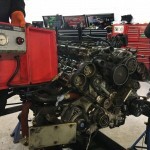 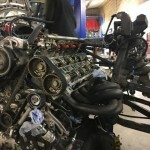 In order to inspect further and fix the cam timing we need to remove the engine from the car. 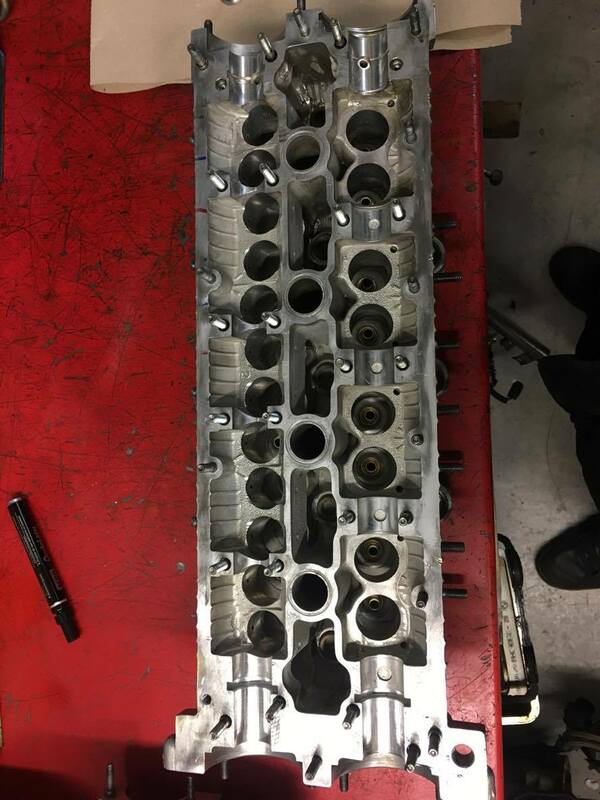 We ‘dropped’ the engine out of the car and re-aligned the camshafts to then be able to perform a leak-down test and check the compression. 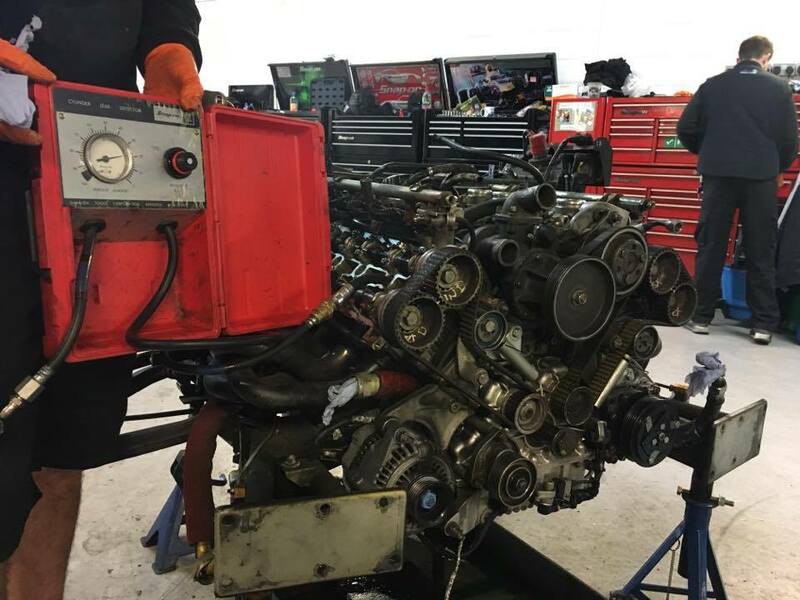 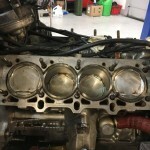 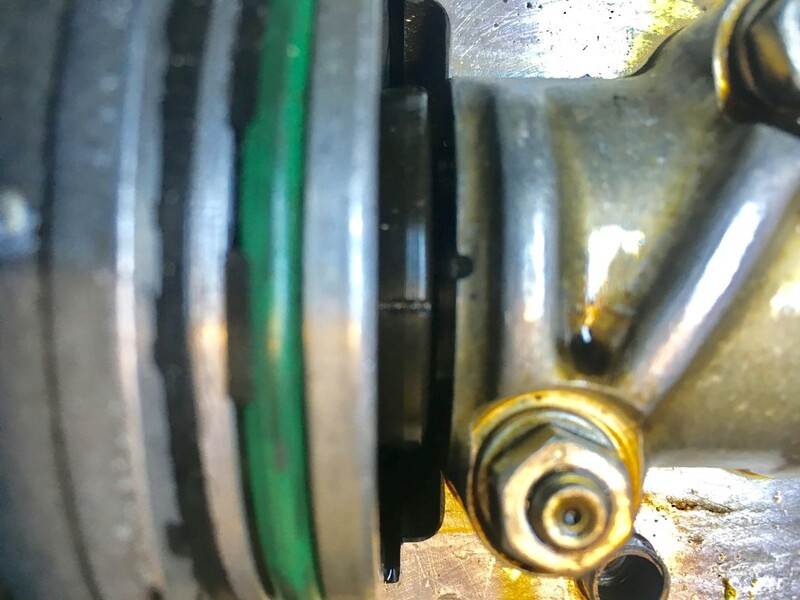 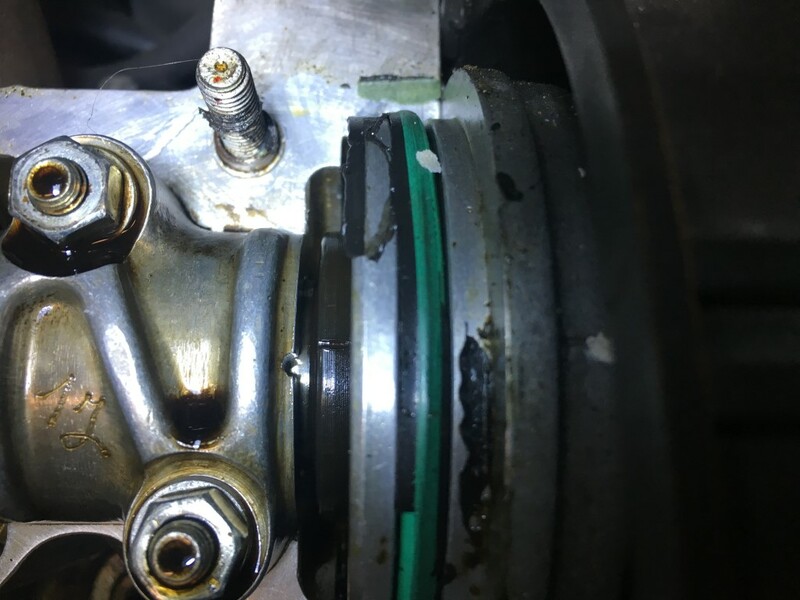 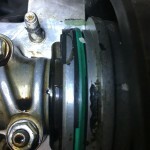 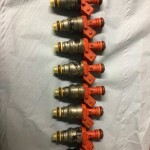 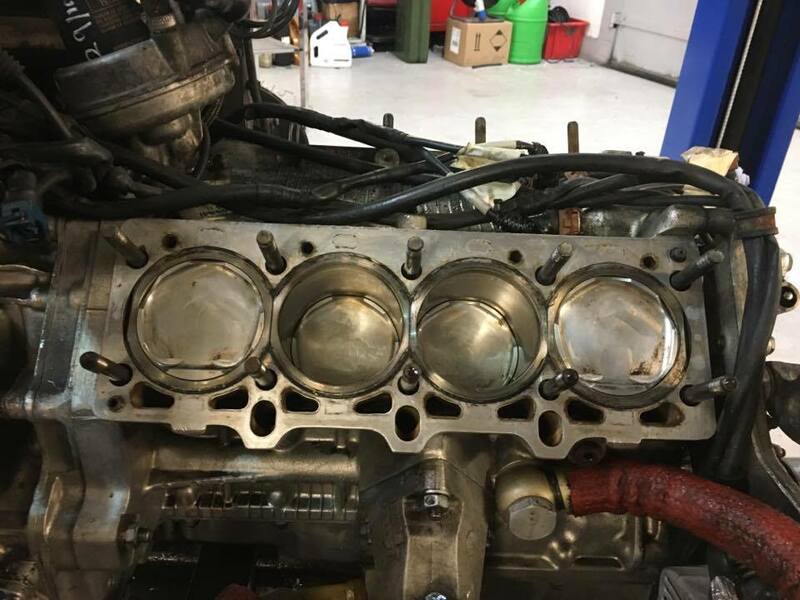 We noticed various cylinders had high leak back through the exhaust valves, which means loss of compression in these cylinders and reduction in power and performance. 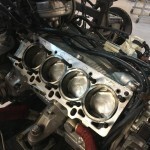 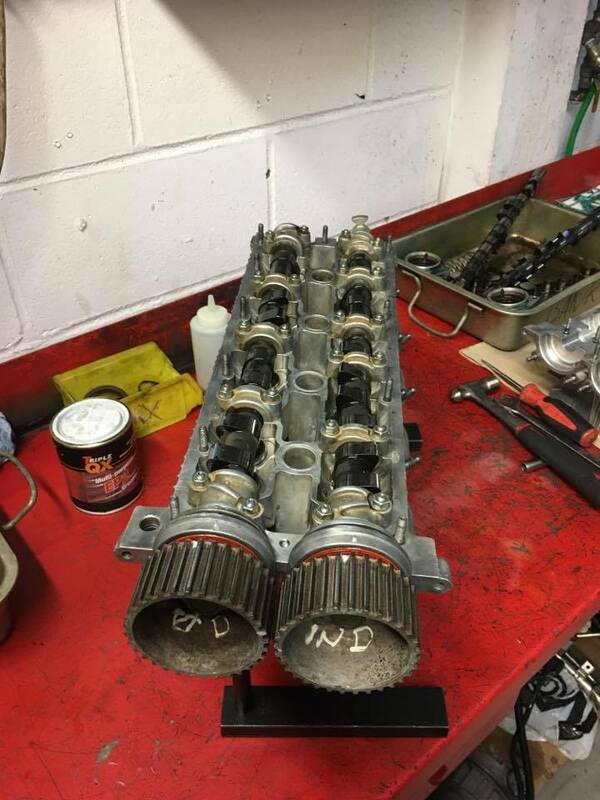 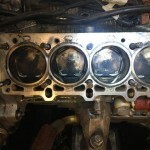 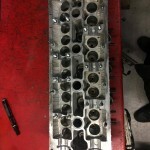 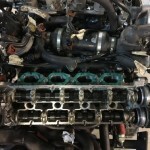 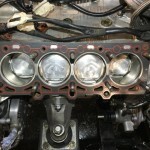 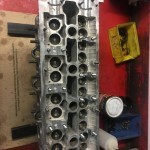 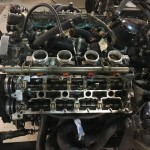 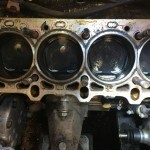 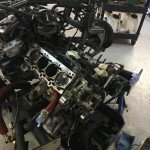 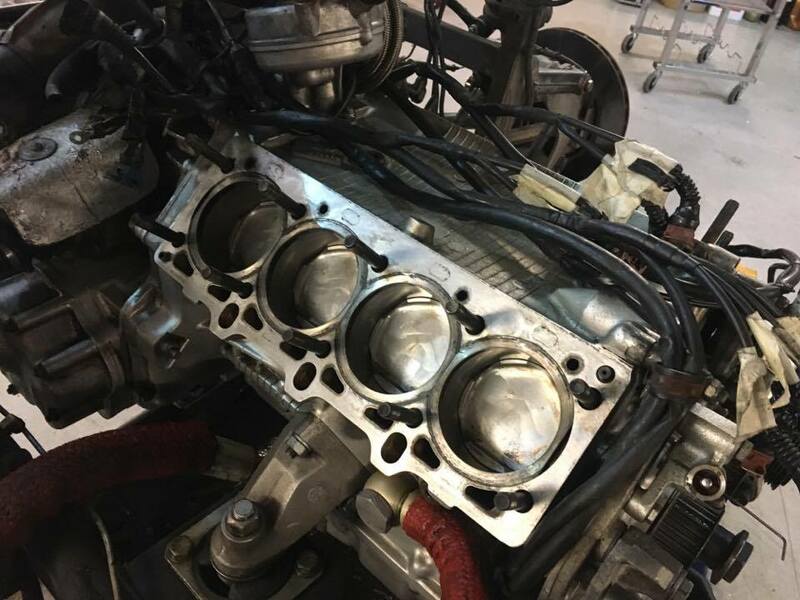 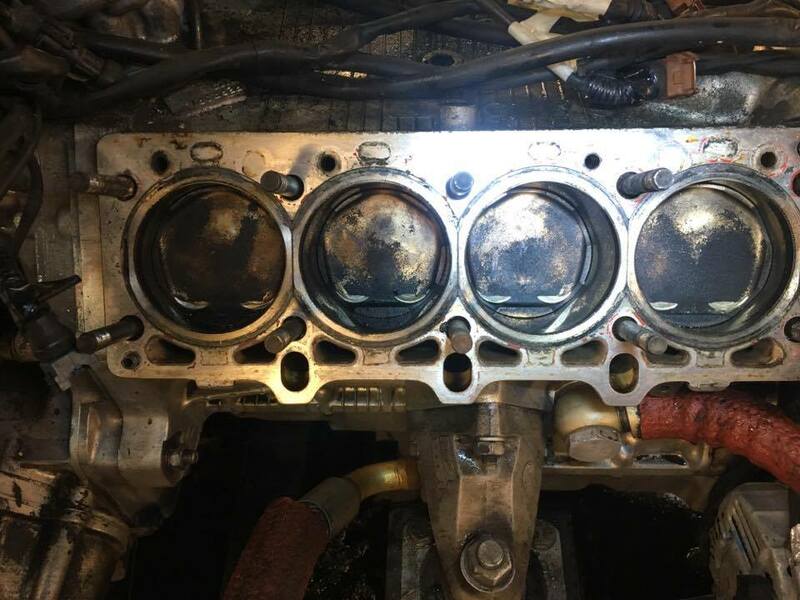 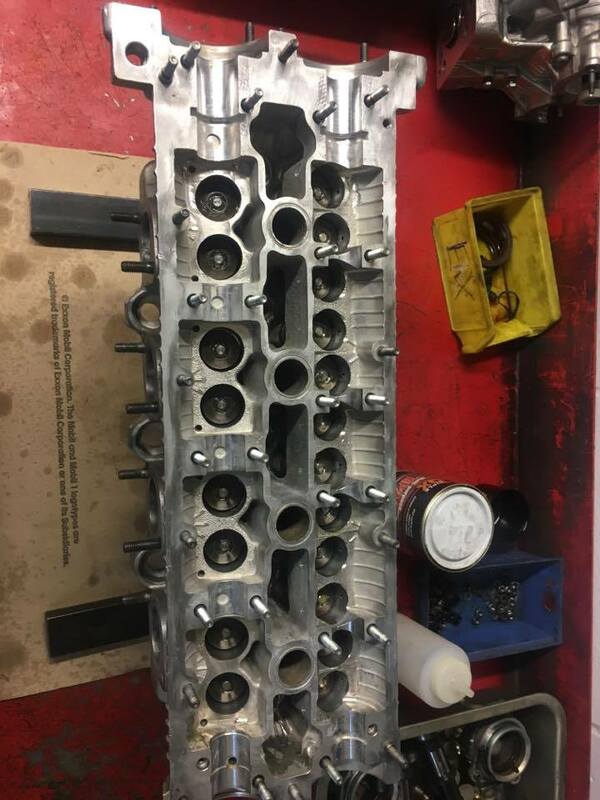 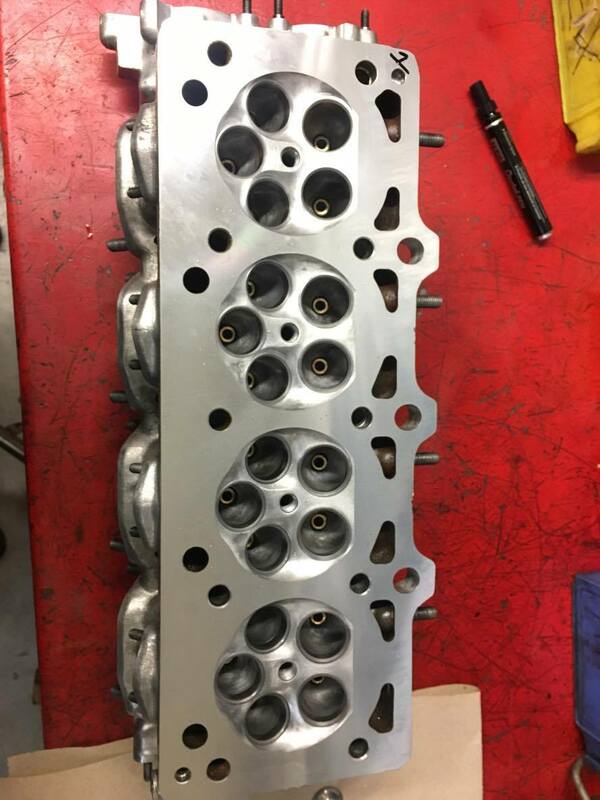 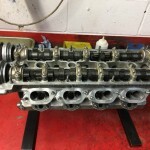 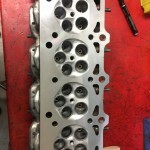 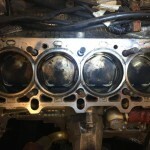 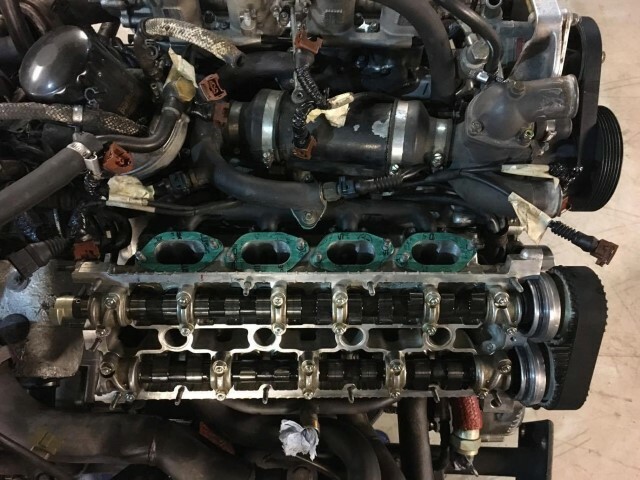 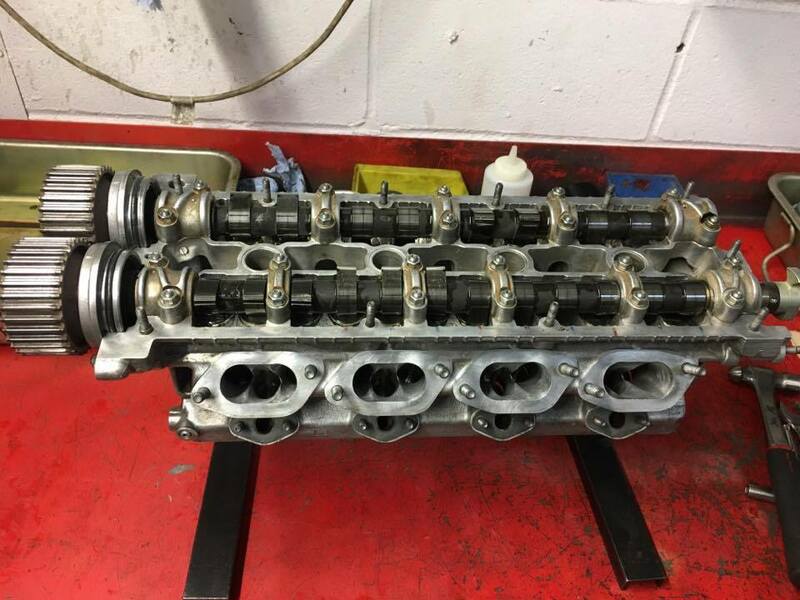 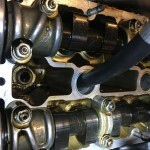 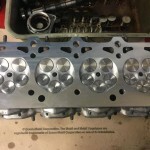 We have informed our client up to this point and next up is to remove the cylinder heads for further investigation. 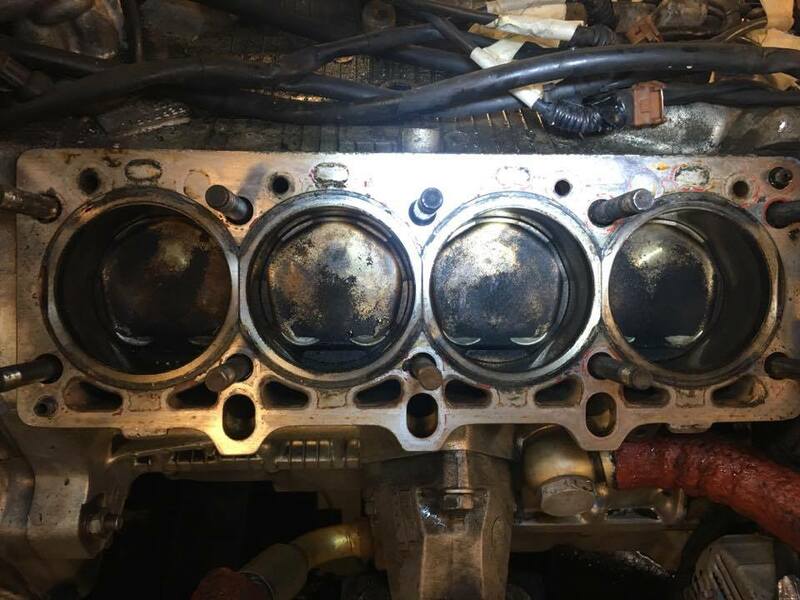 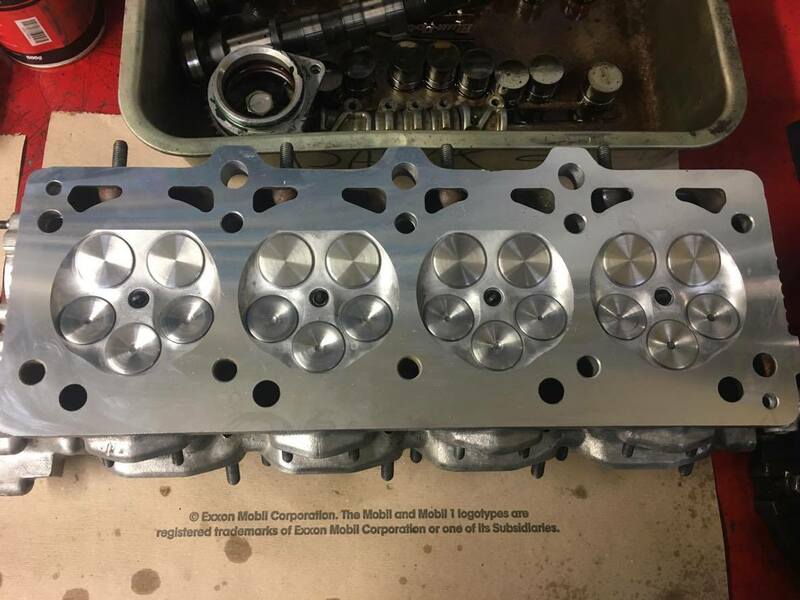 We have removed the cylinder heads and found the exhaust valves to be hitting the pistons, this wasn’t bad enough to bend the valves but bad enough to cause unwanted noise and reduced power and performance. 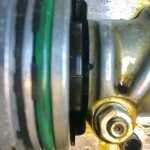 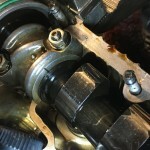 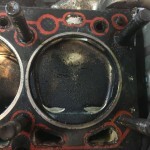 This is the result of the valve timing being out which is what we will fix. 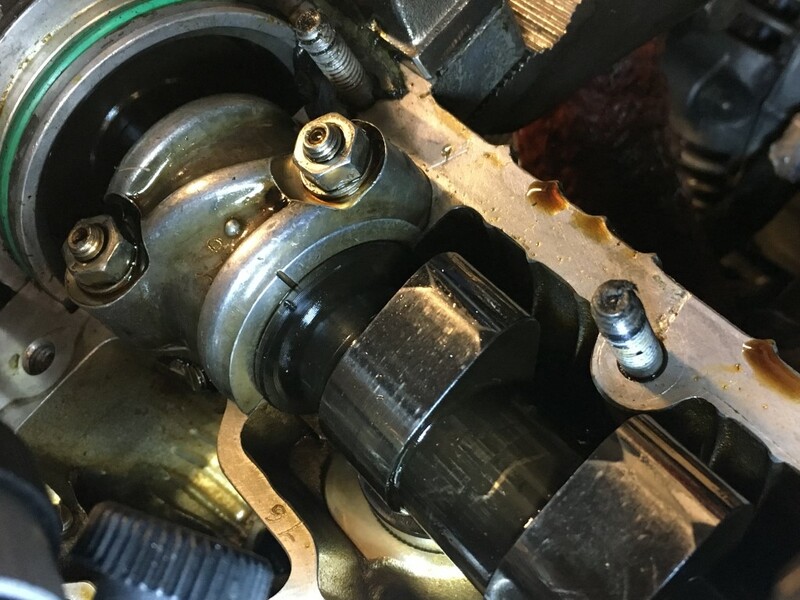 We noticed there was substantial play in both the inlet and exhaust valves, this is due to worn valve guides which will need replacing. 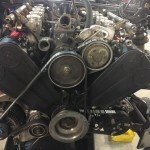 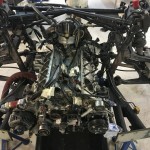 All the inlet and exhaust valves were re-cut and re-seated in the head with new guides. 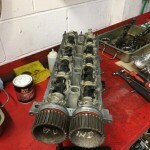 The engine is now all back together, the cylinder head went back on complete with new gasket and new cambelt kit. 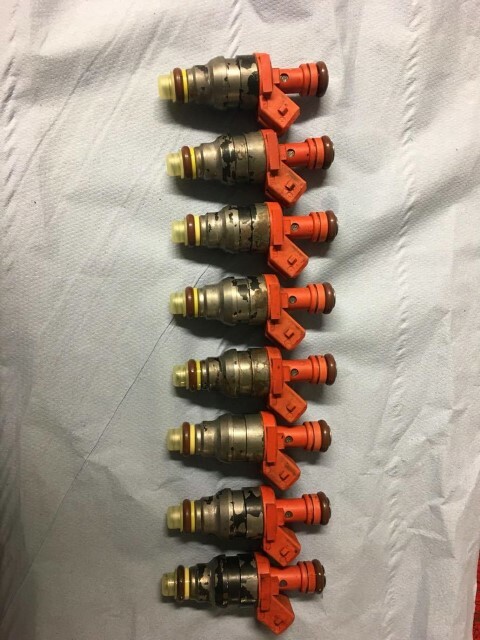 We have now received the fuel injectors back from detailed testing and cleaning and have gone back in. 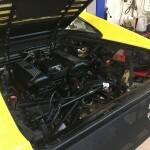 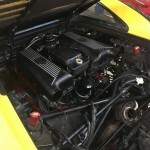 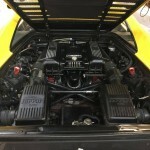 The engine has now been tested and been fitted back into the car. 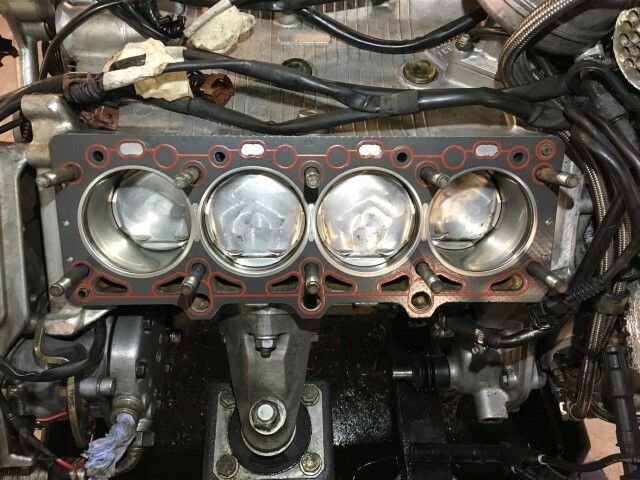 Running smoothly with no unwanted noise. 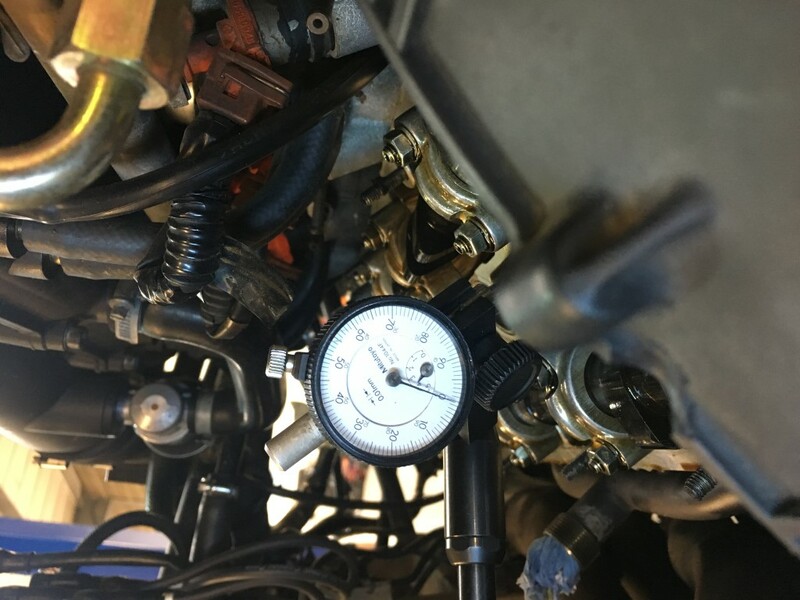 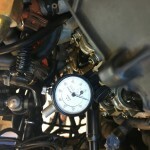 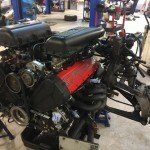 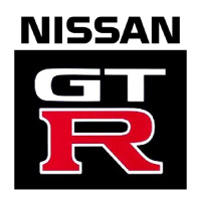 Next we will test further on our dyno and map the engine if needed for optimum fueling and ignition timing. 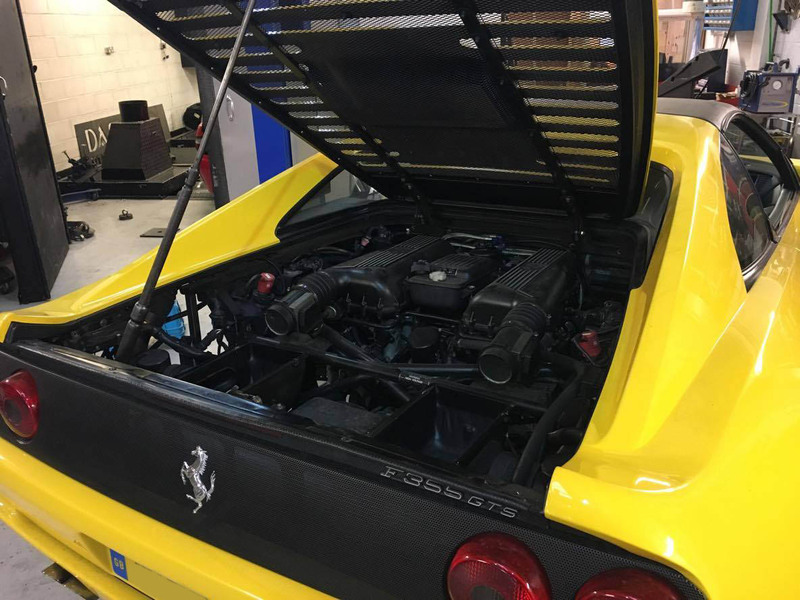 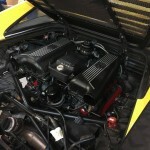 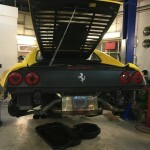 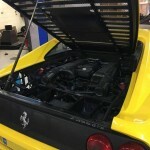 We tested the F355 on our dyno and the engine successfully produced 360bhp with it pulling cleanly to the red line. 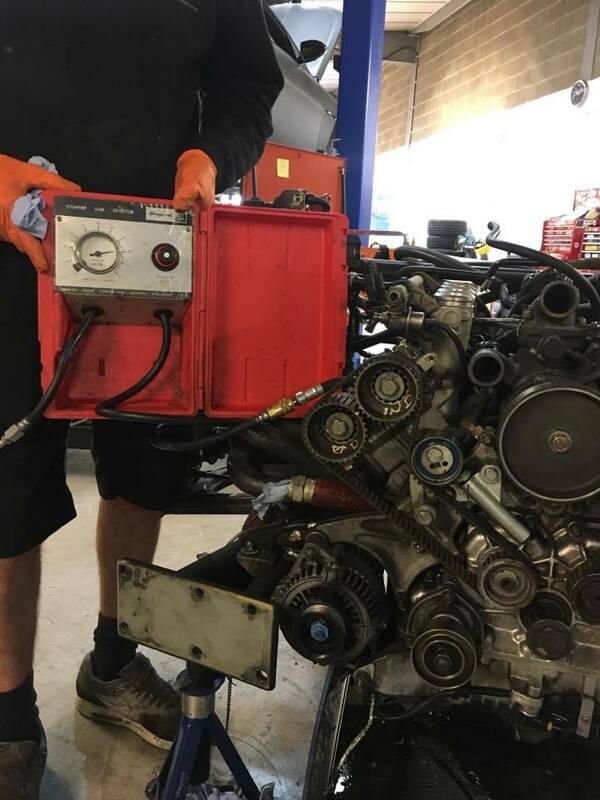 Watch the video below – and turn up your volume!